The biggest animals to walk the earth, 30 times heavier than any elephant, were herbivorous four-legged dinosaurs known as sauropods. Sauropods, which include the thundering Apatosaurus and Brachiosaurus, had remarkable features beyond their titanic bulks: These creatures had gigantic necks, some stretching as long as 40 feet. But just how high these animals held their heads is a source of contention among paleontologists. Several researchers think that sauropods had stiff, horizontal necks for grazing. Other scientists insist the animals could have had necks that curved upwards to eat leaves from trees. A key to solving this debate is to determine the flexibility of sauropod napes: on a scale from rubber chickens to steel beams, where did dino necks fall? A recent discovery could shed more light on the riddle of sauropod posture – though scientists are conflicted about what the finding means. A team of German paleontologists closely examined neck parts from Mamenchisaurus, Diplodocus and Brachiosaurus and found that these fossils represented a special type of bone known as ossified tendons. Typically, tendons are tougher than muscles but not as hard as bones. Yet in some cases, tendons can calcify into bone while an animal is still alive. In the process of tendon ossification, cells called osteocytes sneak like bricklaying ninjas into tendon fibers and begin building bone. Ossified tendons had also been found in Iguanodon and other ornithopod dinosaurs, a group of two-legged and four-legged dinosaurs smaller than the sauropods, and a few species of birds, such as turkeys. But when Nicole Klein, a paleontologist at the University of Bonn in Germany and a coauthor of the new paper in Biology Letters, looked at thin sauropod neck bones called cervical ribs under a microscope, she saw the distinctive cross-hatched pattern of tendons. Several experts on sauropod posture agreed on the discovery’s bona fides. “I am very impressed with the work,” said Kent Stevens, a professor of computer science at University of Oregon who uses mathematical models to image dinosaur skeletal systems. One of the paper’s reviewers, Mike Taylor, concurred. “So far as I can tell, it’s right on target,” said Taylor, a paleontologist who works as a software engineer at Index Data in the U.K.
What dinosaur experts don’t agree on is how ossified neck tendons influenced the way sauropods held their necks. In the publication, Klein and her coauthors argue that ossified neck tendons support what is known as the ‘tensile member’ hypothesis. According to this hypothesis, proposed by Klein’s collaborator Andreas Christian, a biology professor at the University of Flensburg in Germany, sauropods had lightweight and flexible necks with enough mobility to raise the dinosaurs’ heads. The heaviest muscles would have been at the base of the neck, and cervical ribs would have acted like tension wires in a bridge – slender and supportive. Under the ventral bracing hypothesis, the cervical ribs, which overlap like shingles on a roof, would have stiffened the dinosaurs’ necks into a more horizontal posture. The neck muscles would be spread out, leading to a weightier neck. University of Oregon’s Stevens also thinks this discovery can support his view of sturdier necks and lower heads. In his opinion, such ossification would have reduced neck flexibility instead of increasing it. In 1999, Stevens, along with his San Jose State University colleague J. Michael Parrish, created a computational model called DinoMorph. The DinoMorph calculations showed that sauropods primarily kept their heads close to the ground, and certain species, like Diplodocus, couldn’t raise their heads higher than their backs. Index Data’s Taylor does not think that sauropods had such level necks. “The evidence best supports the historically accepted hypothesis that they spent most of their time with necks well elevated,” he said. When Taylor began to study dinosaurs in 2000, many paleontologists accepted the conclusions from Stevens’ DinoMorph. Taylor, however, no longer believes in DinoMorph – or, as he called it, the New Orthodoxy of its time. “As I started to look into it, I found all sorts of problems,” said Taylor, arguing that Stevens used a Diplodocus specimen with a broken spine to form the basis of the computer model. Today, Taylor thinks sauropods had a much wider range of motion than what the DinoMorph paper predicts. But Stevens defends his model, arguing that Taylor’s claims of incomplete data in DinoMorph are unfounded. 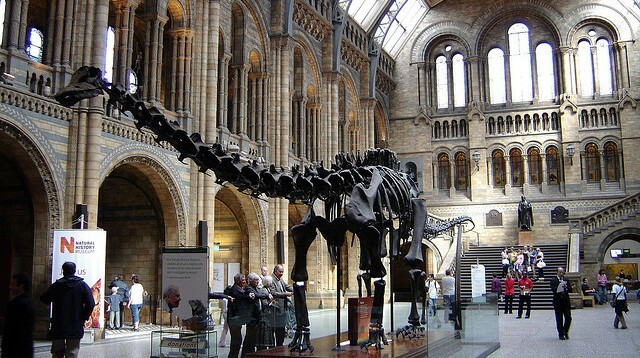 He agrees that the Diplodocus Taylor mentions is inaccurate – but, Stevens points out, that specimen is a composite skeleton made from fossils and casts of several dinosaurs. Stevens took measurements from only one of those Diplodocuses and ignored the improperly aligned areas of plaster reconstruction. “Paleontology has some practitioners that are close to religious zealots,” said Stevens, lamenting the “Wikipedia-based hype” he sees on the internet regarding extreme feeding heights. To understand dinosaur posture is to understand their feeding habits, because giant animals will conserve energy by limiting how far they move their heads while browsing. Paleontologists are currently trying to estimate the amount of energy these animals would have expended as they ate. And the discovery of ossified tendons, said Christian, is crucial for understanding neck position and mechanics. Once we fully grasp the flexibility of sauropod necks, we’ll be one step closer to knowing if these creatures gazed on treetops or grazed on grass. Benjamin Guarino holds a B.S. in bioengineering from the University of Pennsylvania. After graduation he joined Penn’s Spine Pain Research Lab, where he studied the motion of artificial intervertebral discs and the painful effects of whole-body vibration. Upon discovering that engineering journals discourage metaphor, Ben decided to shuck his lab coat and don a press badge at SHERP. He’s fond of long runs and bad science fiction, and his Erdos–Bacon number is seven. Why would any animal evolve with a very long neck, only to keep it at the same level as its back? Look at today’s giraffes! Their heads are up in the highest parts of the trees and sauropods would have been the same because they too had very long necks.